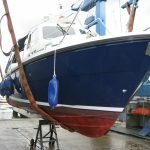 To evaluate whether the boat you’ve got in view is a good buy, it’s best to have a full inspection carried out before you commit. Some defects are more easily fixable than others, and the overall deal will depend not only on the initial outlay but also the repairs or enhancements you’re likely to have to make in the short and medium term. Once you have the report the decision to buy or not to buy is yours, but you can make it with your eyes open. check of safety equipment, including fire prevention and fire fighting equipment and life saving appliances e.g. lifejackets, life rafts, etc. The report will be confidential, detailed and prepared for you alone.